There is a simple set of eight exercises that is good for health and can be performed by most people. This set of exercises has been around for a long time, about 1,000 years; so it has been well time-tested. It is called Eight Silk Brocade or 八段錦 in Chinese. It belongs to the category of Qigong exercises, which are stretching, breathing, and meditation exercises. It is often used as part of the warm-up exercises in a Taiji class. The exercises can relax you, stretch different parts of your body, and strengthen your muscles. It is relatively simple, takes only a few minutes to do the set (the length of time of course depends on the number of repetitions for each form). If you have not tried it, I highly recommend that you give it a try. Donald Trump has been the President of the U.S. for only less than two years, but the consequences of his presidency for our country and the world could be profound and scary. From the perspective of the environment, harmony with others, economy, American competitiveness, tax cuts and budget deficit/national debt, world stability/democracy/rule of law, his impacts have been grave and significant. This article is in two parts. Both parts are posted in this same December 2018 release. Part I is posted in the “Political/Social Commentary” page. Part II is this article posted in the “Other” page. Sections I-III are in Part I, and Sections IV-VI are in Part II. During July 25-27, 2018, I participated at the 13th International Conference on Interdisciplinary Social Sciences at the University of Granada in Granada, Spain. The theme of the conference was “Autonomy in Times of Turmoil: What to Make of the Social?” I presented a talk titled “10,000 Cries for Justice” (to see the Powerpoint presentation, click here). 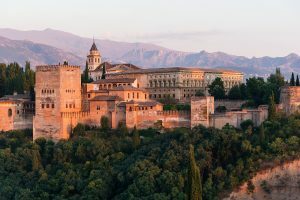 The day before the conference I joined a tour of Alhambra, the famous palace and fortress whose history spanned about a thousand years involving Arab Muslims, Christians, Spanish, French, and Roman kingdoms, and it is now one of Spain’s major tourist attractions. Palace-Fortress of Alhambra (by Jebulon). Click on picture to get a larger photo. This article provides a short description of some of the history and tales of Alhambra. Its popularity was partially due to the writing of Washington Irving (1783-1859), one of the first American writers getting acclaim in Europe, and is best known for his short stories “Rip Van Winkle” (1819) and “The Legend of Sleepy Hollow” (1820), and his historical books on Christopher Columbus (1828),  Mahomet (or Muhammad) (1850), and George Washington (5 volumes, 1855-1859). He was also the American ambassador to Spain from 1842 to 1846, and he lived inside the Alhambra palace/fortress for several months in 1829, and published the book Tales of the Alhambra (1832). This second article provides more details about these basic components of Push Hands.